By the great hammer of Thor!!! 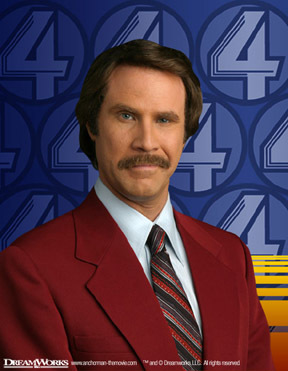 ‘Anchorman 2’ is officially in the works. Judd Apatow, Will Ferrell and Adam McKay will produce the film with McKay directing and writing the screenplay with Will. All the cast members will be back including: Steve Carell, Paul Rudd, and David Koechner. Not only did the sequel get greenlit today, but Ron Burgandy himself came onto Conan tonight and made the announcement himself while playing the flute. This project has been on and off so many times over the years, I never thought we would get a sequel. So many of the cast are big time stars now. The 1st film came out eight years ago. But I’m super psyched to see a new story of Burgandy and the channel 4 news team. I just hope all the cameos and Wes Mantooth make an appearance. This entry was posted on Wednesday, March 28th, 2012 at 11:34 pm	and is filed under Film, News. You can follow any responses to this entry through the RSS 2.0 feed. You can skip to the end and leave a response. Pinging is currently not allowed. This sequel is going to be awesome! Can’t wait! Should be good. Looking forward to it.